For at least a generation, Barbie has been a controversial figure. Mattel wants to emphasize her independence and her range of careers, but most people who look at her just see a body. Traditionally, a body with huge breasts, a very narrow waist, and feet that can only wear high heels. A body that is available in a brown version, but that everyone knows is meant to be white. For a few years now, Mattel has been trying to defeat that perception and rehabilitate Barbie; not because they care about feminism or the lives of young girls, you understand, but because they want Barbie to keep selling in large numbers on into the future, regardless of which way the sociopolitical winds blow. The situation became dire for them in September 2014, when Mattel lost the license to make Disney Princess dolls to Hasbro, just as the popularity of Frozen's Princess Elsa went through the roof, making her the most popular toy among girls. So it really should be no surprise that Mattel is trying something bigger and newer with Barbie. 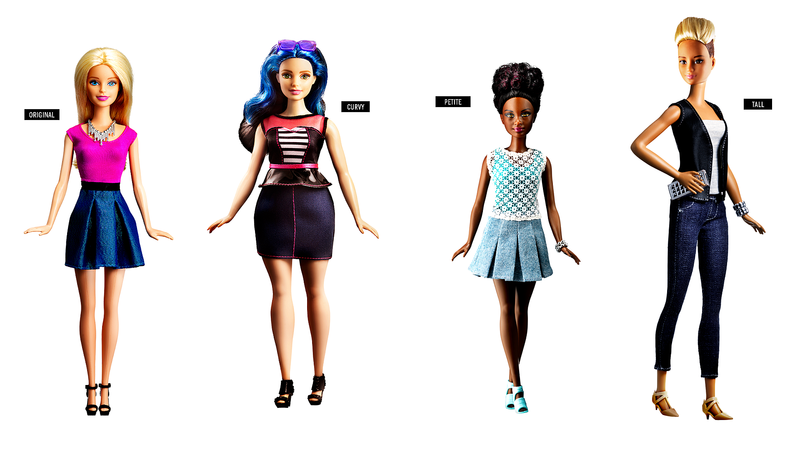 The company has introducing three new body types; in addition to Original Barbie, she now comes in Curvy, Petite, and Tall. Mattel had already been working on being more inclusive of skin colors and hair types, so those factors combine with these new bodies to create a far wider variety of Barbie possibilities. But the question remains, can Barbie defeat her own branding as a skinny buxum blonde white lady? What will she look like in the cartoons (probably the same), and won't that always be seen as "the real Barbie?" And once Mattel admits that Barbie can have more than one type of body, doesn't that just open the door for consumers to demand more? If there can be a curvy Barbie, why not a Barbie who's genuinely fat? Tall Barbie's great, but why not a Barbie with the broad shoulders, small bust, and narrow hips that many actual women have? Still, Barbie's not going away any time soon, and any increase in the diversity of Barbies available feels like a positive step. Looking at this crowd of dolls with big hips and undercuts and bright red afros, I have to admit, they look much cuter and more appealing than the Barbies we're used to.